Join regulatory consulting firm RegistrarCorp for an intensive 4-hour “Boot Camp” on U.S. Food and Drug Administration (FDA) regulations on food and beverages as well as pharmaceutical products. 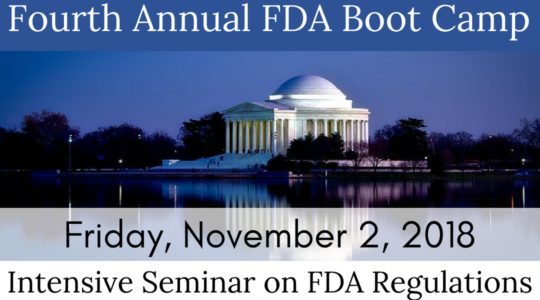 Learn about issues such as FSMA, New Food Labeling Rules, and Current FDA Drug Regulations from a leading provider of FDA compliance assistance. The Washington International Trade Association (WITA) is the largest non-profit, non-partisan organization dedicated to providing a neutral forum in the nation’s capital for the open and robust discussion of international trade policy and related issues. WITA is widely considered Washington’s premier trade forum. Among other activities, WITA hosts educational programs, provides networking opportunities, and provides professional development opportunities. RegistrarCorp was founded in 2003 to help businesses comply with FDA regulations. Since opening its headquarters in Hampton, Virginia, USA, RegistrarCorp has expanded to nineteen international offices and has aided more than 30,000 companies across 160 countries. RegistrarCorp offers services to businesses in FDA-regulated industries, including food, beverages, and dietary supplements; pharmaceutical drugs; cosmetic products; medical devices; and radiation-emitting electronic devices. *WITA has a 10 day cancellation policy for this event. Any cancellations within 10 days of the event are billed to cover costs.